Crimson and lilac, now that's an unusual color combination. In the community of colors, I'd like to think that they are the unexpected duo that looks fantastic together. Come to think of it, I've never featured this color couple before on Elizabeth, Marie, and Me. Well, well, well, this is a first! 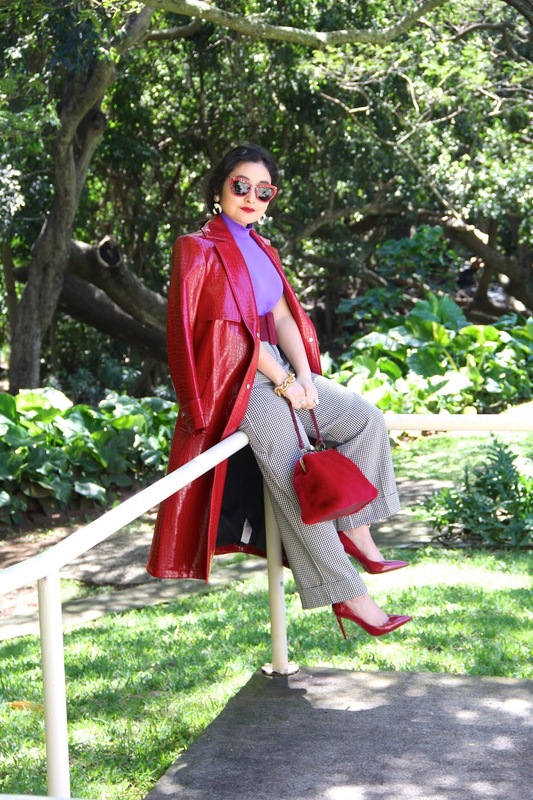 I've been on the hunt for a red coat for a long time and I finally found one that satisfied my style craving. 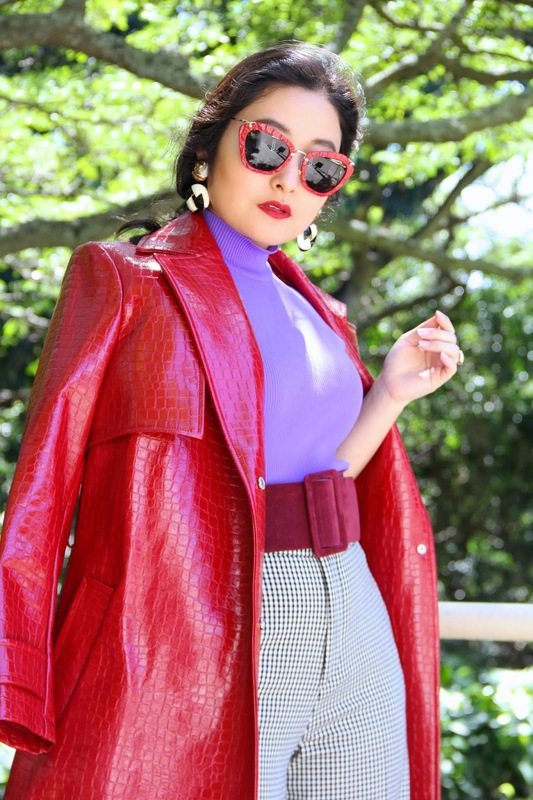 This red faux croc trench coat out-dreamed any expectation I had in mind for an outerwear piece. 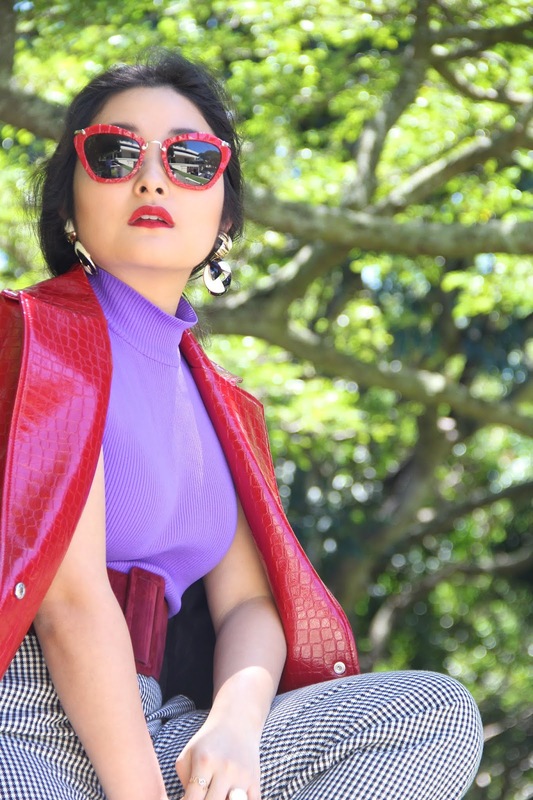 It's bold in hue and I adore the chic faux crocodile skin texture. 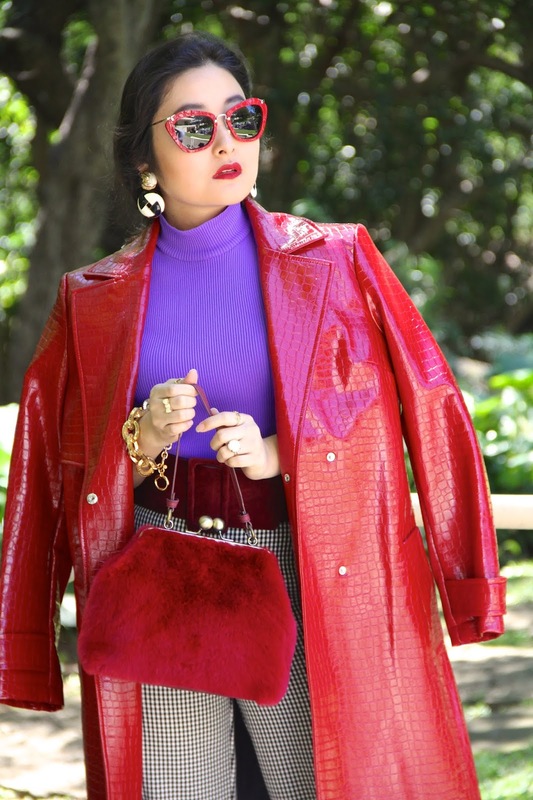 Every gal needs a statement coat in a fun color! 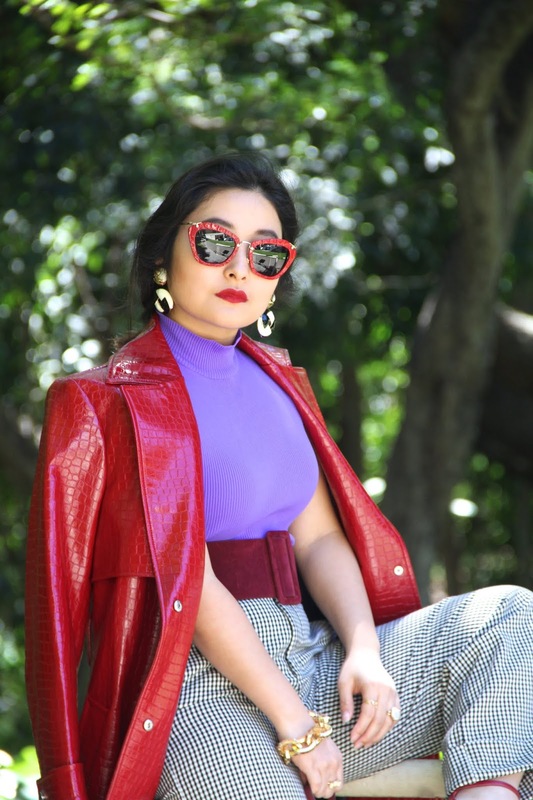 Since I chose to contrast the red coat with a lilac ribbed mock neck top, I didn't want to introduce another bold color that would rival the stars of the outfit. Therefore, I chose a pair of high-waisted tailored black and white checkered pants because I think the subtle classic print added a bit of interest to the bottom portion of the look. 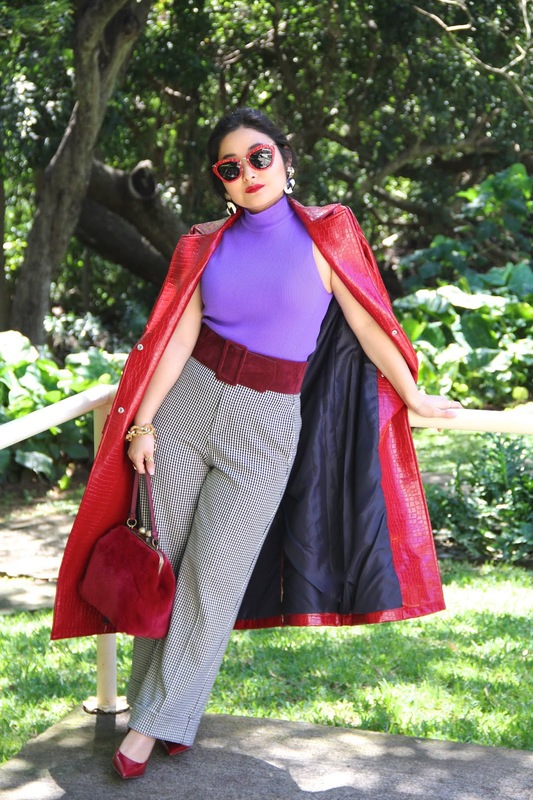 For accessories, I opted for a pair of red pointed heels, and a couple of burgundy accessories- a wide belt and a faux fur purse because burgundy is the darker, vampier sister color to crimson. Even if it is a different shade, I love the way it pulls the whole look together without appearing too matchy-matchy. And I cannot forget to touch upon the accessories that add that glamorous sparkle! 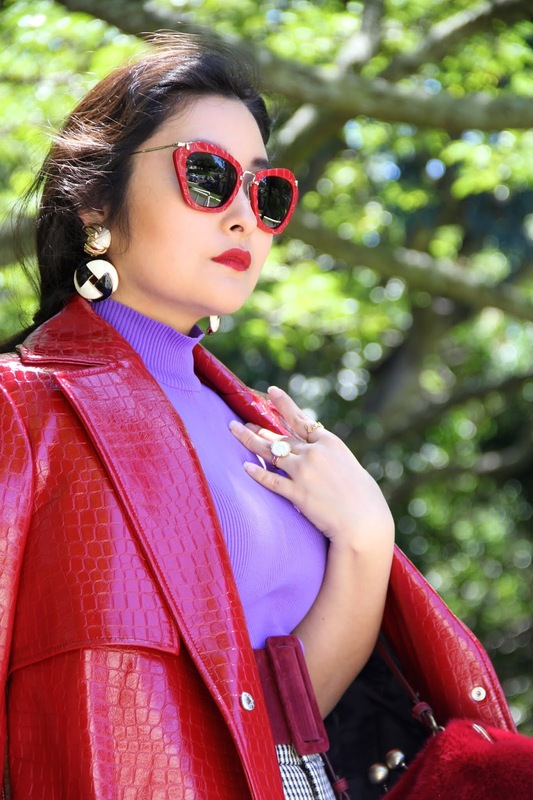 I selected a pair of red Miu Miu sunnies and popped on a pair of statement black and white earrings. For the finishing touch, I toggled on a gold chain bracelet and sprinkled my fingers with an assortment of gold rings. This crimson and lilac outfit is complete! Let me know in the comments below if you love this color combo and if you'd try it out yourself! If you're hesitant when it comes to mixing colors, I encourage you to give it a go! You never know what will look good on you! At the end of the day, if it brings a smile to your face, wear it! You are the only one who needs to approve of your style. As always, I am sending you lots of love from my heart to yours!